Bill Mauldin, the World War 2 soldier-cartoonist whose sketches captured the spirit of the U.S. infantryman, has noted that "the mail is by far the most important reading matter that reaches a soldier overseas ... A soldier's life revolves around his mail." Letter writing quickly became the soldier's primary way to keep a grip on reality and to stay in touch with his dreams and plans; his thoughts of home kept his spirits high through the danger, loneliness, and the boredom of war. In 1942 a soldier wrote home to his family that the most important things to a soldier are food, ammunition, and mail, though not necessarily in that order. But in the early days of the war, food and ammunition moved more rapidly to the front than mail. When the letters from home arrived, they were sometimes months old. To overcome these long delays, Army Postal Director Colonel William Rose developed the system of microfilming the mail. 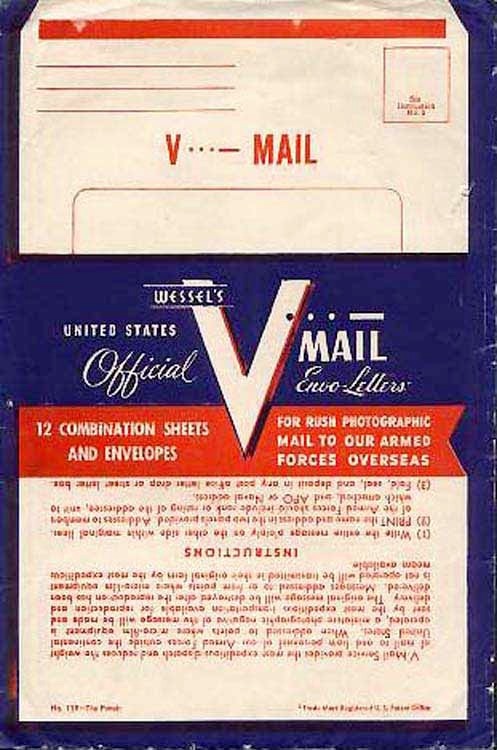 Victory Mail stationery−commonly known as V-Mail−was instituted in the summer of 1942. V-Mail was a special eight-and-a-half-by-eleven-inch white sheet of paper with space for approximately seven hundred words. By means of microphotography batches of sixteen hundred letters written on this paper were transferred onto ninety-foot rolls of 16-millimeter film. the film was then put into small boxes each weighing four ounces−reducing a ton of mail to twenty-five pounds. When the boxes reached their destinations, the film was developed. Finally, each letter was enlarged to a four-by-five-inch print and put into a window envelope for delivery to the stated address. Thanks to V-Mail, a soldier at war could receive a letter from the United States−or send one home−in less than two weeks. That was a morale booster of inestimable value. As Admiral William Halsey wrote to Admiral Chester Nimitz, "Please stop the flow of Washington experts and sightseers to this area. Each expert means 200 less pounds of mail. I'll trade an expert for 200 pounds of mail at any time." By the end of the war it was estimated that V-Mail had saved 95 percent in cubic footage of cargo space. But for all its advantages V-Mail was not initially popular. The reasons were understandable. V-Mail limited the size of a letter and did not allow for enclosures. And, like a postcard, it inhibited intimacy. There were more substantive reasons for preferring the standard air-mail letter to V-Mail. 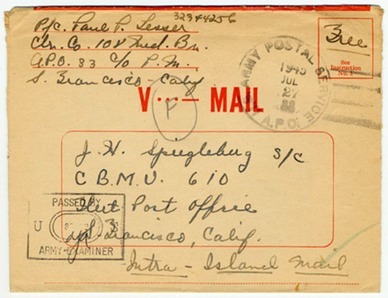 All mail was censored−though officers, who censored one another's letters, were more inclined to approve their fellow officer's mail without reading it−but soldiers thought V-Mail was read by dozens of eyes during transmission. And some soldiers resisted V-Mail because of the myths that sprung up about it. Prominent among them was the suspicion that the film was screened at movie houses in Army camps. V-Mail gradually grew in acceptance. 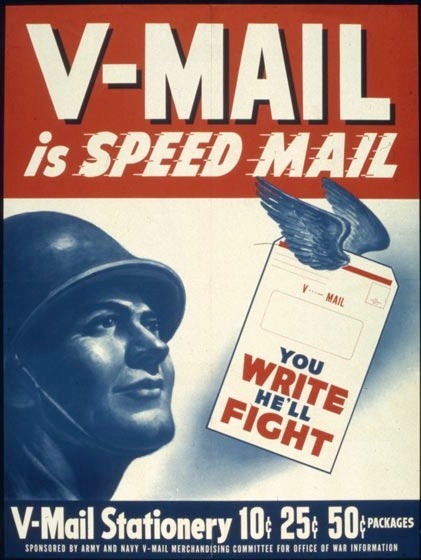 According to the post-master general's report from the war years, the number of V-Mail letters sent from the front jumped from 18,000 in June 1942 to 7.6 million in June 1943. 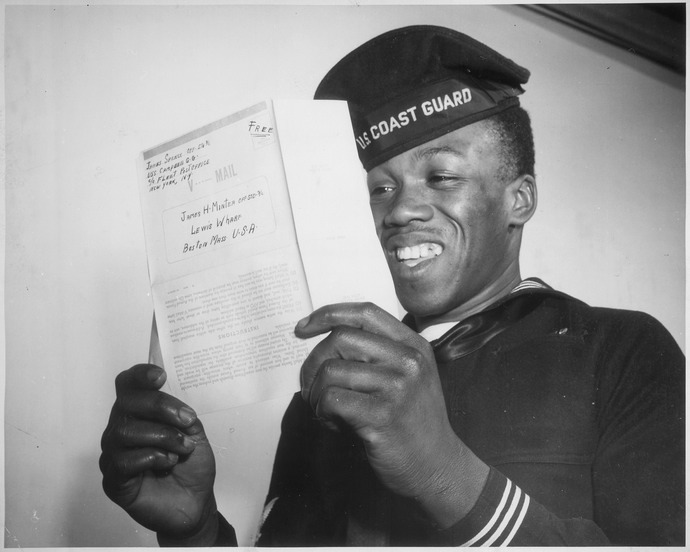 From 1942 to September 1944 a total of 789,539,390 V-Mail letters were sent to and received from members of the armed forces overseas. By the war's end the estimated total of V-Mail letters dispatched was over one billion. And as we like playing soldiers it may be good to remind ourselves that war no matter what is a sad and grim business. The two letters Corporal Bob De Ridder from Holland, Michigan wrote to his aunt and uncle and the letter they sent to him but was returned could not illustrate this better. Bob was with the 518th Parachute Infantry Regiment, 17th Airborne Division. He took part in Operation Varsity, the airborne landings across the Rhine in March 1945. He never got to eat that ice cream he was dreaming about. Corporal De Ridder was reported missing in action, later confirmed deceased, April 14, 1945. Just three weeks before hostilities ceased with Germany's unconditional surrender on May 8, 1945.